Alumni will join thousands of New Yorkers for the city’s largest volunteer day. New York Cares meets pressing community needs by mobilizing caring New Yorkers in volunteer service. RSVP by September 30. 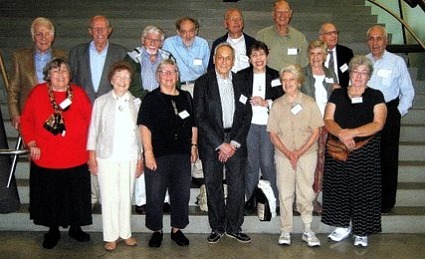 The Class of 1951 celebrated the 60th anniversary of their graduation from The Cooper Union, joined by class leaders Stanley Goldstein (EE’51), Marilyn Marcus (A’51), Jack Goodman (ME’51), Alvin Knoll (AR’51) and Annamay Olsen (A’51). Over 42 alumni gathered at The Frying Pan, a historic lightship docked at Pier 66, to enjoy the warm summer weather and cold drinks. The event was hosted by the Events Committee and coordinated by Melanie Chung (CE’07) and Lefty Pittas (CE’11). 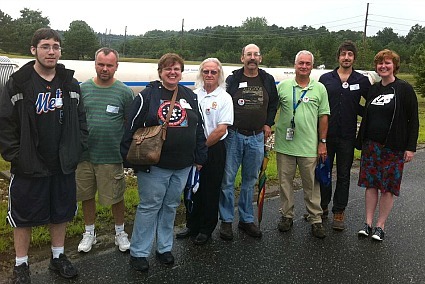 24 alumni and their guests visited Brookhaven National Lab for its Community Summer Sunday open house. Alumni visited the tunnel that houses the twin particle accelerators, the PHENIX and STAR particle detector experiments (which are each bigger than a house! ), and AnDY, an experiment which will perform a polarized Drell-Yan (DY) feasibility test – annihilating a quark and an antiquark in a hadron-hadron collision. A surprise highlight of the tour was a chance encounter with Joseph Tuozzolo (ME’76), who works at BNL and was facilitating tours that day. The event was hosted by the Events Committee and coordinated by Charlie Cassella (EE’68). Click here for more photos by Karina Tipton (CE’99). Q: Describe your current work at BNL. A: The C-AD is responsible for the operation, upgrade and maintenance of multiple particle accelerator systems that make up the Relavistic Heavy Ion Collider. RHIC is a particle collider that can accelerate protons to gold ions (Uranium soon) to nearly the speed of light and then collide them in order to determine their make-up. RHIC is basically a factory and the engineering group maintains and improves that factory to meet the physicists needs. 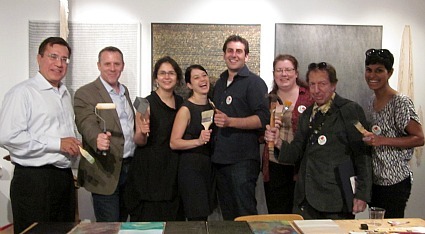 A Chicago pop-up event was held at Homa Shojaie’s (AR‘91) art opening at the Chicago Artists’ Coalition, where Shojaie is a BOLT Resident. Alumni attendees not only saw the BOLT show, but were also treated to a tour of Shojaie’s studio downstairs in the Chicago Artists’ Coalition building. The event organizers were Zev Soloman (AR’01), Michal Raz-Russo (AR’01) and Malini Ramanarayanan (CHE’00). 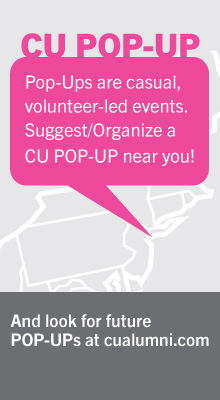 Q: What events have been hosted by the Chicago Alumni Group? A: The Chicago Alumni group was only recently formed, but has gathered for a wide variety of activities in a short time. Our initial gathering was hosted by Paul Korniczky (ME’82), whose office at Leydig, Voit & Mayer overlooks Millennium Park in Chicago. The purpose of the event was an artist talk with visiting Cooper graduates Ryan and Trevor Oakes (A’04), who had created a site-specific sculptural installation for Millennium Park entitled Have No Narrow Perspective. The Annual Fund would like to say “Thank You” to all of the loyal donors who contributed to the 2011 campaign. The Annual Fund provides essential support for the most immediate needs of Cooper Union, and we look forward to sharing the final results of the campaign you as soon as they are available. 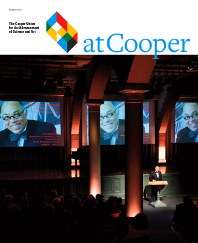 You are the foundation of Cooper Union, and we welcome your continued partnership during 2012! Give Now. Nearly 600 alumni have made contributions to the Alumni Roof Terrace Campaign, donating a total of $2.6 million. The campaign closes on December 31, 2011, and there are 100 spaces left. We hope to fill each of these spaces with the names of dedicated Cooper alumni to help us reach our goal of $3 million. Read more. 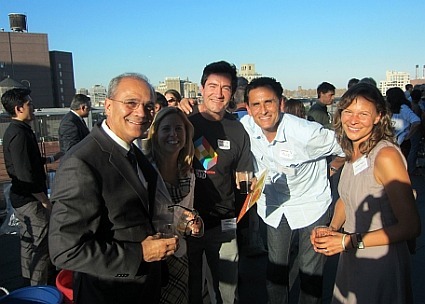 Parents of the incoming freshman class were welcomed on August 30 with a reception on the Alumni Roof Terrace, where they got to know fellow parents of first year students, members of the Parents Council and other members of the Cooper community. We got to know one of these parents, Dawn Distefano, whose son Tyler is studying chemical engineering. Read more about Dawn here. The CUAA welcomes the newly elected members of the 2014 Alumni Council who began their three-year term on July 1, 2011. Get to know the 12 new members. On August 11, artist and longtime School of Art faculty member Robert Breer passed away at the age of 84. He taught film and animation at The Cooper Union from 1971 to 2001. Read more. Recognizing the accomplishments of CU alumni, the Hall of Fame includes nearly 300 distinguished individuals. Click here to read more about featured Hall of Fame members Carin Goldberg (A’75), Stan Allen (AR’81) and Kenneth Bridbord (ChE’64). 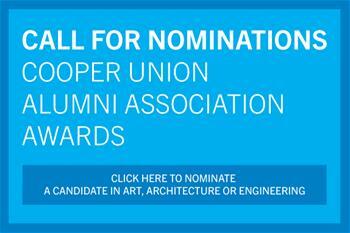 Let us know your news and accomplishments by submitting an Alumni Note.